And we'll be celebrating with a set of stamps. 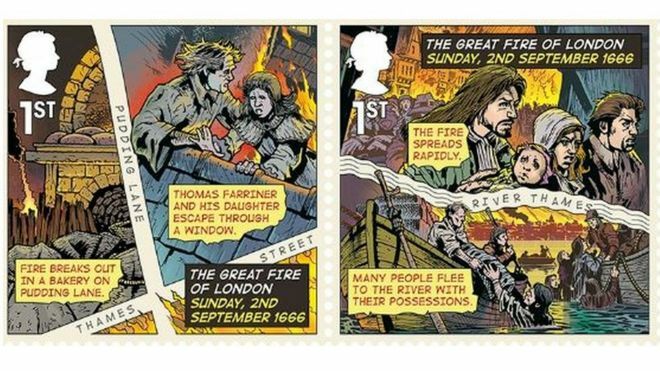 The 350th anniversary of the Great Fire of London is being commemorated with a set of six new stamps. The fire raged across the city from 2 to 5 September 1666, destroying more than 13,000 houses and 87 churches. 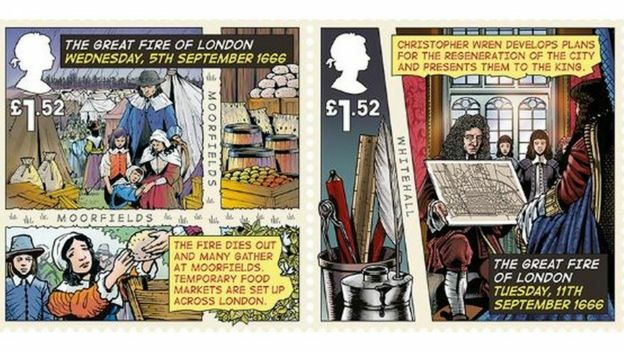 The stamps are designed by comic book artist John Higgins, who has used a graphic novel style of illustration. They feature scenes from the start, spread and aftermath of the Great Fire, using a street map design. Higgins has contributed to titles such as Judge Dredd and 2000 AD. Philip Parker, from Royal Mail, said: "Despite the terrible devastation caused by the Great Fire, it provided the opportunity for the regeneration of large swathes of the city and shaped the London we know today. "It was the catalyst of the building of iconic landmarks such as St Paul's Cathedral and dozens of parish churches. 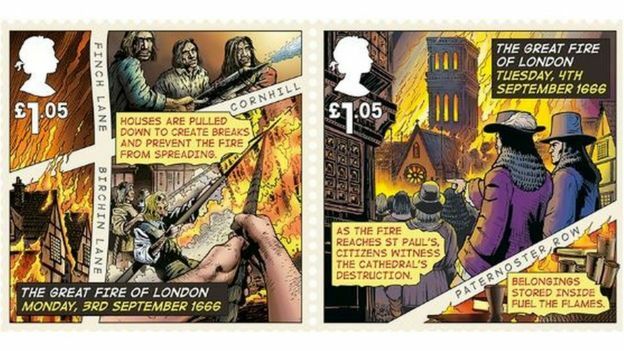 "It is fitting that we mark the anniversary of the fire with an innovative set of stamps that re-imagine the events." [+4] - farmerman - 09/02/2016as they say. "Americans think that a hundred years is old, and Brits think that 100 miles is far"
[+3] - farmerman - 09/02/2016[quote] Ultravox and OMD are as much a jazz combo as they are a garage band. [/quote] so you dont deny that what you offered up sounded like a garage band. Thanks for the interesting stamps and also remining us of this historical and also tradig event. Learned this at Philmont Scout Ranch in New Mexico, 1957, and older version"London's burning, London's burning, Look yonder, look yonder, And we have no water, and we have no water"
Cheerful looking bunch, aren't they. At least the adults are having a great time. the look on the kid with the blue sweat shirt has that "what the **** is it with you people"? "Get me outta here next thing were gonna be learning is about cereal killers"
Yeah. Like I say, it's the grownups that are looking all happy and proud of themselves. 360 years ago was the until then largest European town fire: Aix-la-Chapelle was destroyed nearly completely (90% of the town burnt down, fortunately only 17 persons were killed). The Museum of London has launched a Great Fire of London website to mark the 350th anniversary of the blaze, tracking the course of the fire that broke out in the small hours of 2 September 1666, and over four days tore the heart out of the medieval city. You dont hear any goodHiroshima or Glen Canyon fire songs do ya? the word modifying songs was "good". Not some pices of garage band crap. This is Phil Collins all over again. Btw, Ultravox and OMD are as much a jazz combo as they are a garage band. so? you listren to garage band crap , I lkie some of Phil Collins. Theres good music and theres bad music, thats all. Not all an artists music is "always good or always bad"
Youre just easily impressed by techno ****. ACtually my fav music is hard bop jazz andsome progressive. That pos you offered with the "Enola Gay" title was rely a stinkeroo. SOme of the college stations play **** like that to make it appear that they are really in touch with something. One night my nephew called me re the PRinceton station was plying a something "really neat" by WAlter Piston. I said that he too was easily impressed with a single harmonic played for several minutes. Ultravox and OMD are as much a jazz combo as they are a garage band. so you dont deny that what you offered up sounded like a garage band. I do deny it. They're 80s synth pop. It's nothing like garage. » The Great Fire Of London started 400 years ago today.